This will be a long and windy road and maybe is a bit premature to start, but I have a question concerning how to lower the suspension and didn't want to hijack Junkman's topicon his build of this kit, the Heller Citroen 15 CV. This is MY Holy Grail and have wanted a model of this car since seeing one in an old movie long ago. It reminded me of the 32 Fords being sectioned and channeled into their full fenders .. a manufacture's hot rod! The body is so rounded and low for a car built starting in 1935! A lot has been discussed about the uniqueness of this car in Junkman's post, so check the link to it mentioned above. 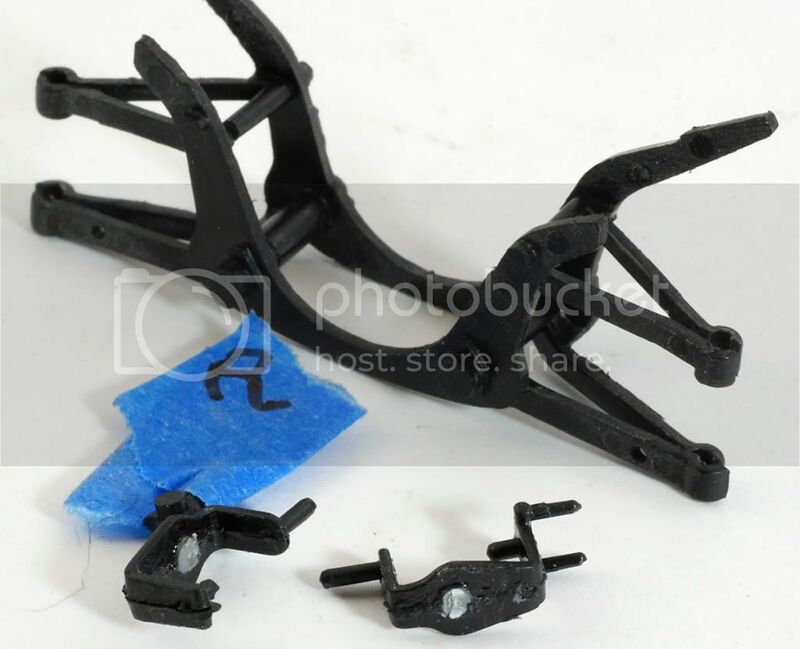 Anyway, here's shots of the suspension pieces and mounting off the instruction sheets for reference. I'd appreciate any thoughts and ideas on getting this into the weeds. I am planning on a wheel/tire change to something more modern and smaller diameter, but have no idea as to what at this time. As you can see, the suspension is independent with front wheel drive and is well detailed with some pretty fine parts. My first thought on the front was to cut the arms off the wishbone (part 23/37) and pin them back on allowing them to be swung up.This may kick the bottoms of the wheels out since the model has no horizontal pin at the wheels. Maybe it would help the stance. 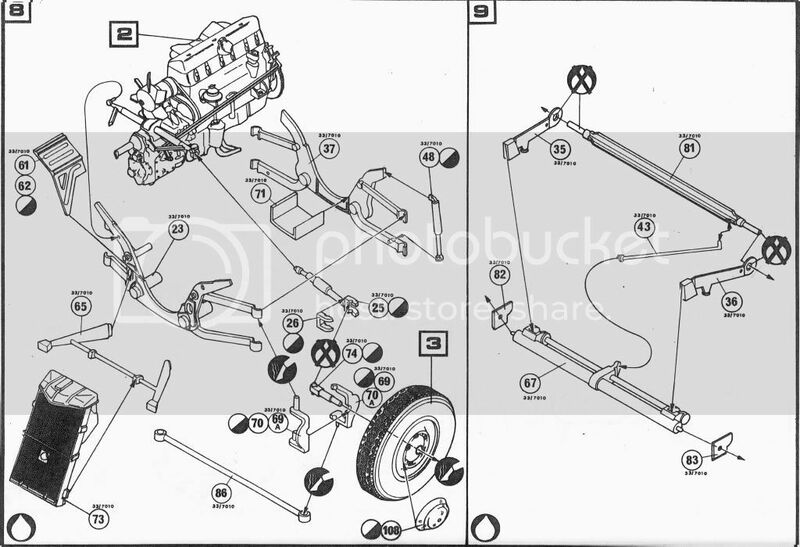 I need to mockup the rear axle to see if just shortening the shocks will raise the axle enough, but just from the instruction drawings, this seems feasible. Hmm, looks like you got yourself in a bit of a pickle with this one. Jus' short of "reconstucting" everything from scratch jus' to make it "movable" and positionable I really don't have any advice. Knowing from seeing these cars (15CV's and 2CV's) in person in Italy and France they are a rather complex FWD System. 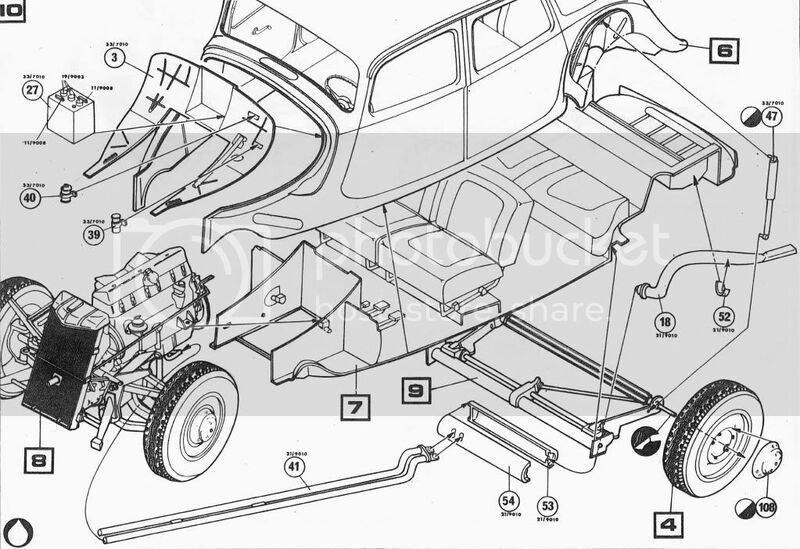 The Rear Suspension on 2CV's is suppose to "ratchet" or swing independently of each other as most Independent Front and Rear Suspensions do w/ Upper and Lower A-Arms. The 15CV's look to be like the VW Rabbit/Golf, Jetta, Scirroco, and some Audi style rear set ups. Shortening the Shocks might help there. Sorry I can't be of any better help. I can't wait to see how you figure this dilemma out and see how you build this wonderful car. i think you've got a pretty good idea already on how to drop the front of this thing. maybe not the easiest way to go, but in the end probably the best way. the other thing i wonder about here with this one is the front track width and how that could become an issue maybe. once those tires are properly tucked up into the fenders they still need room to turn left and right. i'm wondering if narrowing the track width similar to a dropped VW's front beam is something that may need to be done here too. If I can detach and pin the arms to swing up, the camber will change since there's no pivot at the wheel ends of the arms for the wheels to remain "vertical". With wider tires it will also get tight up in the fenders. It's going to be a tough one to measure, but maybe a cheap stand-in of sheet plastic will let me get an idea of clearances and how the wheels will look when rotated. I guess the tightness of the wheels in the fenders won't bother me too much considering how many tires on this forum loose their tops going down into the weeds! I'm also open to ideas that might not be realistic on a 1:1 with some suspension butchering. Since this is going to be somewhat a hot rod the easiest way would be to drop in a hemi and plumb a driveshaft to the Ford rear end! But, I like the unusual drive layout here and will have to at least destroy the front suspension before I go with a dropped '40 Ford axle in there. Your gonna want to drop the front spindles on this ride the same way we drop Hot Rods in 1:1 if you cut the axle hold on the spindle and move it up higher this will drop the fron end down. then its just a matter of setting the rear axle higher on the frame hook up. I hope this helps you. I did look at the front spindles originally and I could get about 1.5" from that at the max. I now see that I should be able reverse side with the spindles and get a full 3". Looking closer, this may be easier than I first thought. The wheel mounts to a shaft that goes through a hole in the flat spindle. This hole can easily be moved up and the half shaft mounts to the the inside end of this shaft. It would just be a slightly shallower angle and shorter on the half shaft but it would still be going to the center of the wheel if visible. Now to figure if 3" will be enough. And, stick to the old hot rod ways before getting exotic! Just a quick update to show where this is going. The 2-piece spindles were glued and the hole for the wheel shaft was plugged with a piece of sprue. A new hole will be drilled "higher" in the spindle giving a 3" drop. This required switching the left and right spindles to gain the most drop and is easily done. This should be enough and should significantly alter the stance. There's still a couple small pieces of sprue on one spindle, so ignore that. Now sitting in the shop with glue getting a good set before proceeding onward. The rear axle is almost a press fit and has plenty of mounting options to get the same 3" drop. Thanks to those responding. As usual, you got my brain a thinking! The answer to your question is in this sheet, provided you don't use the stock engine. The entire front axle assembly, i.e. parts 23, 71, 37 and all the drive train parts that go with it, are attached to the front of the body. On the real car, this assembly was attached with a mere four bolts so the entire unit, including the engine and gearbox, could be pulled forward from the car for servicing. Now, on the model, there are no locator pins whatsoever, so you can attach this assembly at any level you like. Whooshbonk, the front is lowered. Since the original Engine would travel up with the suspension assy, it wouldn't fit underneath the bonnet (hood) anymore. You hence need an engine, which is overall lower than the upright I-6 and can be lowered into the car behind the front axle assy, so it can sit low enough to clear the bonnet. For this, imho only a V8 will do, which you mount backwards, i.e. with the bellhousing to the front of the car. To this you mate either the gearbox/differential unit of the Cit, or you adapt a Toronado/Eldorado transmission/diff unit. Or a Gurney-Weslake from a GT40. Or even a VW Beetle Bug. Why I know this? Because it HAS been done on real cars! To lower the car in the rear is easy. You attach the trailing links at an angle, like the torsion bars would be turned two-three notches in their anchors. Actually, if you mount the rear axle assy and let the car rest on its wheels before the glue sets, it will lower itself. I've been working my way through the front PUZZLE, slowly gluing what I can to see how it all comes together. From your explanation, I see how part 71 goes now and what it does. I was not at the point I could see how the engine front mounted securely, but now I do. Is there that little clearance that moving the engine (not all together here) will hit the hood? I am planning to leave the original in just because it all looks so neat. I had a 283 small block waiting for mounting in a dragster on the bench and that looks like a very tight fit, though maybe not that bad once it is raised. It sure looks like a shallow fuel injection setup would be needed for sure in the end. So I just talked my out of the easiest way of all that you gave me. I'm seeing there will be clearance issues with the half shaft ends if I move the axle (part 74) up as much as I can, but I don't have a problem thinning the top of more than is realistic. I also see now switching sides with the spindles gets me about 2.18 inches before I even re-drill the axle! So that can be less than the 3" move I figured and still end up with maybe close to a 4" drop. So far I don't see a problem with switching sides other than maybe re-engineering the tie rod. The rear is an easy drop, as you say. I like your idea of doing it after the front is in place and just pushing it down to match. It's actually part 37 that attaches to the body. This is where you can shift it up and down. With the stock engine in place, there is not much leeway to clear the bonnet. Bertoni (not Bertone) was determined to make the car as low as possible hence there is little clearance between the rocker cover and the bonnet to begin with. If you want to retain the stock engine, you may 'U' parts 23, 71 and 37 more, which will enable you to raise the entire axle unit vs. the body, while keeping the engine/gearbox unit in the stock position. The driveshafts will then simply have a different angle, but this is compensated by the joints. It would work, even on a real car.